Lalique has launched Les Compositions Parfumées, a new collection of five luxury perfumes based on metals: Bronze, Electrum, Zamak, Silver and Gold. Les Compositions Parfumées follows 2014's Noir Premier collection. Harmonious blend of metals melting together, as the perfumery's raw materials come together in beautiful and unique scents. 5 different fragrances based on metal alloys and precious metals. Bronze (shown) ~ floral; with rose, lily of the valley, violet, tuberose, orange blossom, musk, amber and vanilla. Electrum ~ floral chypre; with bergamot, freesia, pear, rose, jasmine, sandalwood, patchouli, vetiver, amber and musk. Zamak ~ spicy woody oriental; with bergamot, tangerine, pink pepper, orange blossom, freesia, nutmeg, cedar, leather and vanilla. Silver ~ chypre leather; with cardamom, lemon, thyme, galbanum, vetiver, leather, patchouli and cistus. Gold ~ oriental vanilla; with bergamot, lemon, iris, jasmine, lily of the valley, benzoin, patchouli and vanilla. Lalique Les Compositions Parfumées Bronze, Electrum, Zamak, Silver and Gold, are available now at Neiman Marcus, $250 each for 100 ml Eau de Parfum. They do. I haven’t even tried the Noir Premier yet though. 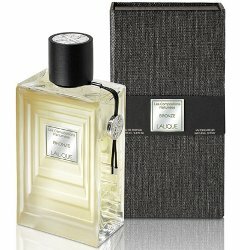 While I love the bottle, I wish they had continued to use it only for Hommage à l’Homme and its flankers. Bronze sounds like my thing.. Sort of wished they matched the metal’s colour though. Seeing Bronze in silver makes me a little OCD. I did smell these at Neiman’s last week. I have a sample of the GOLD. It smells like Shalimar. It really does. Maybe a bit more citrus but you will smell the Shalimar similarity right away. I can’t remember what the others smelled like. I do remember thinking that they were of nice quality but expensive and nothing groundbreaking. They are all reminiscent of other popular classics … i.e. ; Shalimar. I will have to give the rest of a line a proper sniff and sample. I wonder if any of these will actually have a metallic tinge? Something akin to a bright yet sweet-ish coppery note slightly reminiscent of blood. I like that. Not that I would invest in any of them due to pricing, but anyhow.